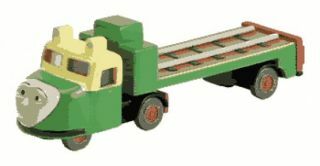 The Thomas & Friends Wooden Railway - Madge is a snub-nosed truck with a three-wheeled cab and a flatbed. What she lacks in elegance, she makes up for in strength and personality. She is the prime organizer of the little engines but she can be playful and loves a joke. Madge pulls engines on flatbed!